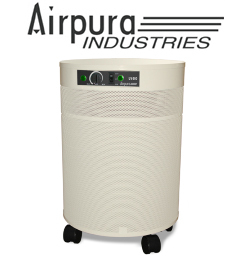 Airpura air purifiers combine true medical-grade HEPA filtration and activated carbon to deliver excellent overall air purification for home, office, clinic, or hospital use. A vacuumable pre-filter traps large contaminants such as pet hair and dust. The HEPA filter removes smaller airborne particulates (99.97% reduction of particles 0.3 microns and larger) include those responsible for virtually all common allergies (pollen, dust mites, mold spores, pet dander, etc. ), and the activated carbon filter removes gaseous contaminants such as volatile organic compounds (VOCs), other chemical contaminants, and odors. Several models are also equipped with specialized chemical filters, and/or ultraviolet (UV) sterilizers to enhance protection against microbiological contaminants such bacteria and viruses. All Airpura models are based on the same basic platform - a tried and proven 560 cubic foot per minute (maximum) variable speed fan-driven system with a simplified air flow pattern which reduces noise and increase air handling performance. A unique pressure seal system and felt gaskets ensure that contaminants are unable to bypass the filters, thus maintaining the high efficiency rating of the HEPA filter at all times. The one-piece motor and fan assembly helps reduce vibrations and noise. The wide range of available filter choices allows you to select an air purifier that is customized for your own specific needs whether it be general allergen removal, microbiological contaminant control, tobacco smoke elimination, or chemical reduction. Recommended Application: Due to the wide range of filter options, Airpura air purifiers are an excellent choice for individuals requiring specialized or targeted contaminant reduction. Airpura has created an innovative line of air cleaners that focus on specific contaminant groups or environments while offering excellent general all-round air filtration as well. Several Airpura models are the top rated by our staff for their targeted contaminant class. Safe effective air purification for home, office and workshops. Enhanced special blend carbon adsorbs VOCs and specific chemicals together with true HEPA for particles. Airpura R600, C600, T600, H600, V600 and UV600 air purifiers are backed by an impressive manufacturer's 5 year parts replacement, and 10 year labor repair warranty. *The Airpura I-600 has a 2 year parts replacement / 5 year labour warranty.